Just a quickie this week as it’s that time of term. The new OCR spec and Cell Membranes. The effect of temperature on membrane permeability is still there, and we’ve already 5-PAGGED (i.e. covered Practical Activity Group 5) with beetroot discs and colorimeters. Here’s my version of this old favourite. It does strike me that this is a perfect example of allowing students to bring their phones to lessons in order to take photos of their work. By printing off the picture of their row of pink/red test-tubes and including it with their graph and table in the PAG portfolio, it’s excellent evidence for the OCR moderators to see on their school visit. Depending on the ability of the class, you could get them to predict the effect, or explain their results after the event. Linking it to the use of soap for killing bacteria also makes them apply their thinking. It works really quickly! They’ll see an effect within 5 minutes, if you like, and there will certainly be enough colour by the end of the lesson for a lovely photograph. Time for coffee and pain au chocolat. Have a good week! 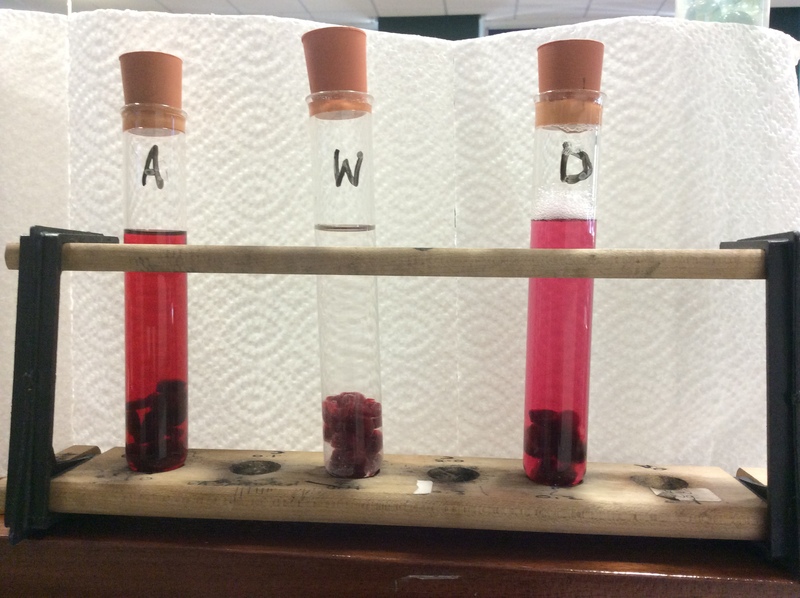 This entry was posted in Year 12 and tagged membranes, solvents on October 14, 2015 by paulweeks2014. Last week I wrote about a last minute lesson plan emerging from a fog of exhaustion and panic (a Groundhog moment from the first year of teaching where every single lesson is like that!). I’m pleased to report that the lesson in question was a great success, the Year 8s enjoyed the activity and could almost immediately understand and explain the difference between their two sets of results ( see attached exercise here Sheep Dash experiment). 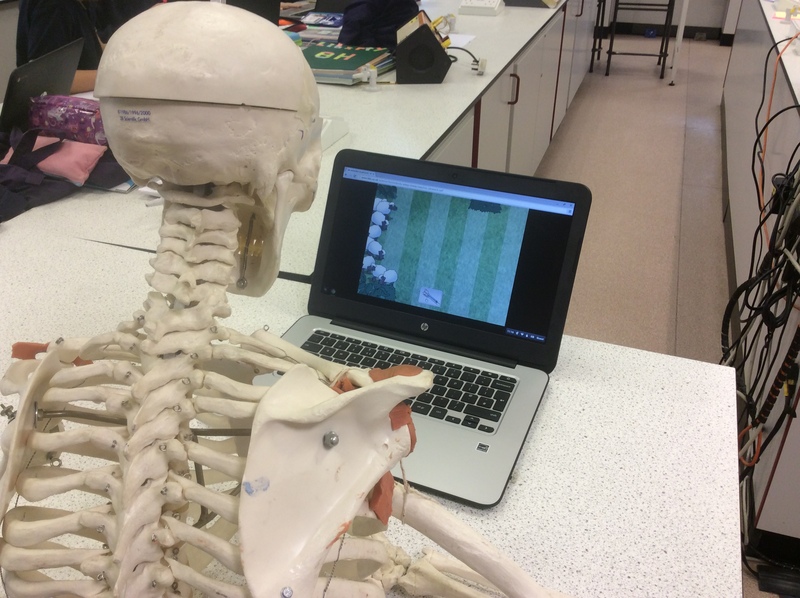 I also made use of the class skeleton and a spare Chromebook to talk them through the sequence of events that take place from the moment that the sheep makesits dash, to their successfully(or not!) clicking the dart gun. I’m following that up with a simplified version of Bill’s marvellous Brain Injury exercise (also see last year) which is an excellent example of how you can turn what could be a dull lesson in information delivery into a lesson of learning and discovery. It’s based on the fact that most of what we know about brain function was originally deduced from linking an injury to a specific region of the brain (stroke being the classic example), to the symptoms that follow. Students “damage” localised areas of the brain and are told the resulting symptom(s) – they then try to infer what that part of the brain does. (brain injuries) It’s also a great illustration of the potential of Powerpoint, where the direction of the lesson is determined by the students’ choices, not by the linear construction of the slideshow. Have a go! It’s strangely addictive, even when you know the answers…. 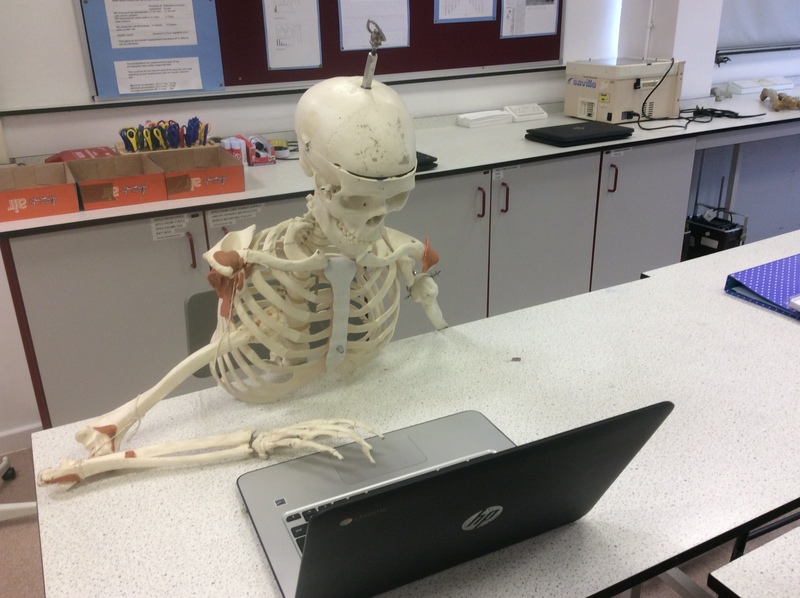 The new Year 12s are adjusting to life at A-level. I talked last Year (22nd October) on my introduction to Water (which is also my introduction to the A-level course). One girl this year got the HIJKLMNO(5) clue in less than a second (literally!) which given that I normally expect this to take 5-10 minutes, rather threw my lesson plan. But once the water circus and the water properties homework is out of the way, I then go back to the importance of the solvent properties, particularly the idea that metabolic reactions take place in solution. I talk about the origins of life. I talk about Miller and Urey and show them this (amino acids intro it’s another one of Bill’s splendid animated Powerpoints), stressing the idea that in certain conditions, complex organic molecules can arise spontaneously out of simple ones. But there’s a problem…. I herd them all into a corner of the lab. You’re all complex organic molecules, I say, amino acids and nucleotides and stuff, all in solution, pouring out of that cold vent in the ocean floor. The rest of the lab is the big wide ancient ocean, 3.5 billion years ago. If you could only bump into each other, we could get life kick started! But what happens….? It’s lovely. They all drift apart, sub-consciously (perhaps) recalling Year 9 lessons on Diffusion, until they’re evenly spread throughout the “ocean”. I stop them. What’s happened???? Why can’t you bump into each other???? Oh no! Life is never going to happen… unless…. What else must we have? They instantly see the need for some kind of enclosing structure to stop them diffusing irrevocably apart. What do we call that enclosing structure? A cell membrane! Aha! And what property, I say, must a cell membrane emphatically NOT have???? This last question usually requires a few seconds thought…. Someone might suggest “permeability”, which is fine – I praise the answer and then park it for a future lesson – but what else? Given what they’ve just done, what property must the membrane NOT have? Yep, that’s right, it must not be soluble in water. Which means it must be made out of something…? Hydrophobic. Can they think of any common hydrophobic organic molecules….? This launches us into Lipid chemistry and the background to cell membranes, one of my favourite topics on this or any other specification. I structure it this way because I like the story, the logical sequence (rather than sticking water into a random lesson half way through the course), and the evolutionary context. I like the way it stresses the primary role of a membrane – which helps when we come on to compartmentalisation – and I always like getting them up out of their chairs and doing something, even if it’s just role-playing an amino acid in an ancient ocean…. This entry was posted in KS3, Year 12, Year 8 and tagged membranes, nervous system, sheep dash, water on September 21, 2015 by paulweeks2014.